You need to make something to eat so you head to the fridge–nothing. Where did that chicken go? Oh yeah. It’s frozen along with pretty much everything else you planned to cook. Now what? 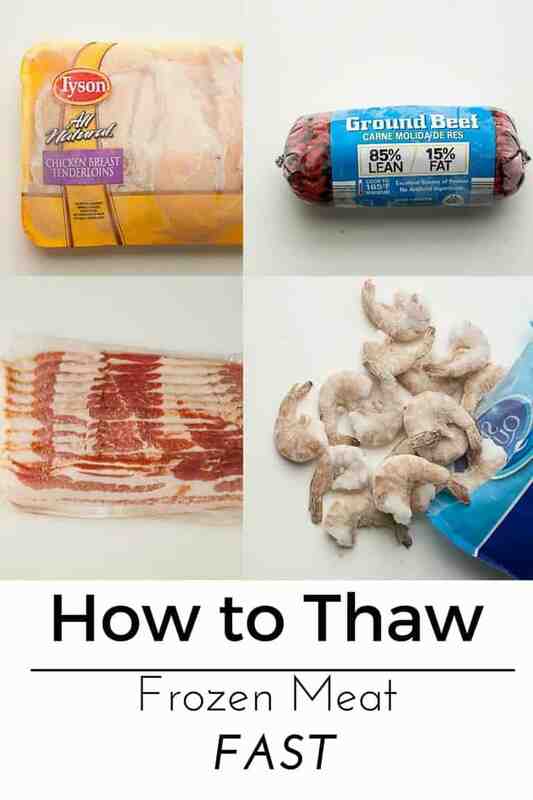 Follow these steps and learn how to thaw frozen meat FAST. Use this method ONLY when you will be cooking the thawed food right away. 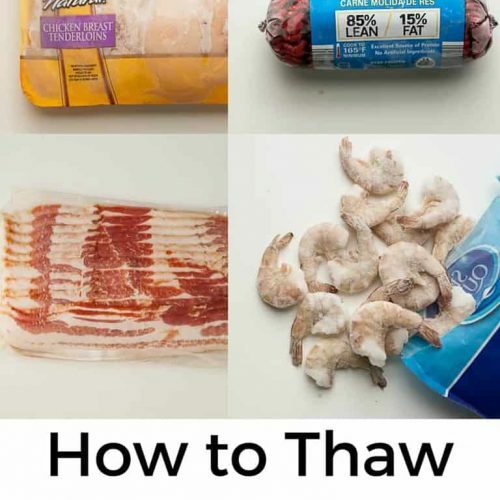 Never thaw meat/warm it and then refrigerate it again. It will grow bacteria. You could puke. Always cook meat to it’s proper temperature. If you don’t know how, it’s good idea to invest in a meat thermometer. Remember to wash any utensils or surfaces that come in to contact with raw meat with hot soapy water and never put an uncooked item like fruits or vegetables on a surface where raw meat has been without washing the surface first. Got all that? Okie doke. From here out, it’s easy sailing. Learn how to thaw frozen meat fast without a microwave. Keep the quality of your meat intact (no rubber edges) and get dinner done in a flash. Place your meat to be thawed in a zip-top plastic bag. Make sure the bag is water tight and doesn't have any holes in it. If your frozen meat is in its original packaging, unwrap it before you put it in the bag. Heat a pot of water large enough to hold the meat on the stove until the water is very hot, but not boiling or simmering. You may see some steam and that's fine. Shut the water off, and place your meat in the water. Use something heavy to hold it down below the surface of the water. Check on your meat every 10 minutes or so until you can begin to separate pieces (if they are stuck together) and keep them in the warm water until thawed. If the water gets cool, it's okay to rewarm it with the bag in there--just turn the burner on for a minute or two then right back off. As pieces begin to thaw you can remove them from the bag and let the other pieces have more time. The total amount of time needed will vary depending on how thick your meat is. For fish or shrimp you should need about 10 minutes to thaw. For boneless chicken about 15 to 20 minutes. For hamburger about 20 minutes. Always thaw responsibly, and happy cooking! Re defroster plates – I ordered a solid copper plate. I ordered the 8 x 8 size to use on my gas stove for small pans but use it mainly for defrosting. Amazing how fast this works. For faster defrosting, run copper plate briefly under hot water then place food directly on top. Within a few minutes you can turn over and defrost second side. Unbelievable how well such a low tech device works. Hey Rachel – While panning through your recipes, I was awestruck in finding this in depth article about defrosting food. I would like to add my two cents worth to that subject, if you don’t mind. About fifteen or so years ago, my late wife gave me an “800” phone number and asked me to call and order a “defrosting plate” for, what else…$19.95 plus the usual. At the time I thought she’d been sucked into one of those telemarketing schemes…how wrong I turned out to be. When the package arrived, I tore it open, as I could hardly wait to see this pig-in-a-poke I had bought. The plate is a metal, coated in a black finish, with eleven, even groves cut in the top surface. It measures about 14″ x 8″ and weighs 2-1/2 lb. The instructions simply said to run it under hot tap water for one to two minutes and place the food to be defrosted on a piece of plastic wrap for forty minutes, and then turn over for another thirty minutes. My wife, Hilda, always wrapped meats in the same procedure when preparing for freezing. First remove all store packaging, next rinse and dry all pieces (as required), next wrap in waxed paper then heavy aluminum foil and finally place in a freezer zipper bag, When she defrosted, she’d open the bag and dispose of the foil and put it back in the bag to defrost on the plate. She found that the foil acted as an insulator and greatly slowed the defrosting time by half. Wow it took me longer to explain this “wizard” than to use it! So why did I bother you with all this superfluous nonsense..,well, simply because I know these plates to still be available, just not from a telemarketer…these things are still showing up at flea markets, consignment shops, etc., and normally at next to nothing prices. I can truly say this is one kitchen tool that has been used at a maximum. Just thought you might want to know. Doesn’t placing frozen meat in the microwave on the defrost setting work? Yes, definately the way to go. I take it a step further and individually package my meat from the store in the cheap (less environmentally unfriendly) ziploc bags, and then freeze them. Come time, I just grab a bag ready to go and actually just put it in the sink with hot tap water. Once I’m done cutting the meat up etc, I’ll just wash the sink to be extra sanitary. I am so gonna try this! I always remember to take out something for dinner around 2 AM! Not going down to the freezer at 2AM…nope, not gonna do it! This will be really helpful..thanks Rachel! Awesome! So helpful. I never thought of thawing meat in a hurry this way!